Saturday afternoon took us to LaMama to see Two-Headed Calf‘s You, My Mother, the new opera project directed by Brooke O’Harra. The project explores the relationship between children (daughters) and their mothers, featuring two distinct halves – the first a collaboration between writer Kristen Kosmas and composer Rick Burkhardt, the second a collaboration between writer Karinne Keithley Syers and composer Brendan Connelly – both performed by acclaimed new music ensemble yarn|wire and a very talented cast of actor/singers. I’m going to start by saying that, while I love LaMama dearly and You, My Mother is dedicated to its legendary spiritual and artistic mother, Ellen Stewart, I found myself wishing that this show was at The Kitchen, Issue Project Room or Roulette, if for no other reason than context. I recently saw a workshop of Joe Diebes’ Botch at HERE and had similar thoughts – not that Botch should have been in another venue, but about context. Botch was a complex, multilayered sound piece with actors and objects that has been generally positioned as theater – but I thought back to Robert Ashley‘s opera That Morning Thing presented at The Kitchen as part of Performa11, and realized that Diebes’ piece would benefit by situating itself as opera. 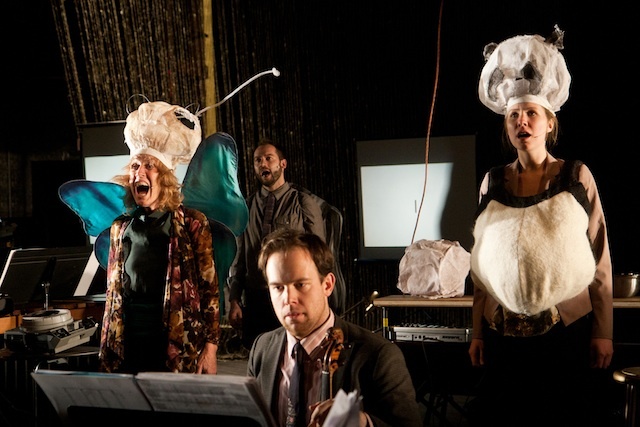 What it is investigating in terms of sound, staging and effect references the traditions of opera more than text-based theater, and while it fits comfortably in either world, an adventurous new music audience might have more access points. And the frame of “opera” might allow the piece to be heard in a different way, rather than being constrained by a theater-goer’s instinct to seek textual meaning or familiar modes of interpersonal interaction. You, My Mother is clearly opera and The Ellen Stewart Theater at LaMama imbued the piece with a certain emotional and aesthetic resonance. The theater is spacious and grand and fairly emanates its history. The musicians and performers were arranged on the stage in such a way that the show felt both intimate and spectacular. The single nod towards multimedia – slide projectors – worked really well with the staging, music and lighting to create an atmosphere conducive to the dreamlike unfolding of fractured and disputed memories that comprised the performance. But I found myself wondering if this piece would benefit from being in a space more known for contemporary music and experimental literature. I felt simultaneously thrilled that I was seeing what I think is really important work, while feeling worried/frustrated that because it is happening in the context of “downtown theater” it is not going to be seen or appreciated by a wider audience. I may be – and hope – I’m wrong, because You, My Mother is a really wonderful and rewarding work. This is an auspicious moment for new music in New York City – there is almost a glut of cutting-edge contemporary opera and art music that builds on modern music of the 20th century while embracing tonality and pop music tropes. There are collaborations between composers and video artists and musicians and performers that are causing quite a stir – from Nico Muhly to Merrill Garbus to Judd Greenstein’s New Amsterdam label and Ecstatic Music Festival, etc. etc. On any given night at LPR alone you can listen to amazing, groundbreaking new music. But, in my limited experience, the text is frequently subpar, or at least not as good as the music. Also, in my limited experience, I haven’t found so much new music that was emotionally complex and evocative – perhaps because of the limitations of the text, perhaps because of an infatuation with technology and overwhelming video, perhaps because. It might also be related to that certain aloofness that comes from being “avant-garde” in New York, that we’ve inherited from the now-legendary groundbreaking downtown artists for the 60’s through the 80’s. You, My Mother inhabits an interesting place in the arc of avant-garde NYC. It feels both new and old, both contemporary and historical. The construction of the work itself feels handmade. As far as I can tell, the yarn|wire ensemble works almost exclusively with actual instruments and found objects, not a synthesizer, laptop or sampler in sight. And the use of archaic technology such as the slide projectors established a feeling of unearthed histories, of memories discovered in a shoebox in the back of a closet in your childhood home. Both Kosmas and Syers are extraordinary writers who share a common fascination with the magic immanent in the mundane, domestic and vernacular. They possess a similar gaze, but each approaches the material differently way, with their own distinct voice. Kosmas is the interrogator of small moments; she finds casual phrases, tossed off words and brief glances, casts a light on them, frames them, makes them resonate with extraordinary profundity. She is a poet of notes left behind on scraps of paper; of impenetrable, heartbreaking miscommunications, a collector of the overlooked. Syers, too, excavates small, easily-overlooked moments, but her voice is at once more interior and expansive, seemingly drawing from the unconscious and making connections between disparate and unlike things. She brings in animals and dreams, takes us into imaginary, frequently playful landscapes, though her words are the last of the show and she leaves us with the haunting sentiment, “I wanted to say so much more, but thinking of you makes me quiet.” [that is how I wrote it in my notes, it may not be the exact quote]. Rick Burkhardt is a fascinating composer, I first saw his work when the Nonsense Company debuted in New York with Great Hymn of Thanksgiving/Conversation Storm, where he used prepared instruments, found objects and spoken text to great effect. In You, My Mother, Burkhardt’s composition is similarly percussive and yarn|wire performs with energy and precision. The voices of the actors, alternating between sung and spoken text, hover over and between the instrumentation, creating phrases, punctuation and scenes that support and reveal Kosmas’ text. The overarching device is the slide show, most of which consists not of images but of descriptions: “a relative’s birthday party”, “a wedding”, “a child’s shoulder blades”. The slides are evocative in their absence of discrete representation, they are the idea of a slide show, conveying a kind of sadness while acknowledging the simultaneous singularity of family memory and the universality of those same pictures. Kosmas focuses very much on the process of individuation and deconstruction – what does it mean to become an adult? Who are we searching for when the iconic Mother no longer holds up and we seek to see her as she is, flaws and all? How do we forgive our mothers for being human, flawed and messy when we would have them be perfect, ever-loving and constant? A funny scene occurs when the daughter, Helen, tries to tell her mother that she is sad, depressed, alone, confused. She speaks, elliptically, of her mother pressing buttons, and we soon realize that they are talking to each other through an intercom from separate sides of the house. Helen tries to instruct her mother on how to use the intercom, until the mother finally asks her to come. A slide flashes on the screen, “Helen walks three miles” [once again, faulty memory on my part, this may not be an accurate quote] and the musicians clomp a pair of shoes on a board for a full minute or more as Helen sullenly walks. The mother says, “There’s something about the way your father built this house”. She is referring to the physical house but it is obvious that there is something wrong with the family’s psychological house, the absent father, the inability to communicate. The interplay between Burkhardt’s score and Kosmas’ words is intricate and skillful – they have complementary senses of rhythm, spacing and tone. And just as Kosmas seeks meaning in the everyday, Burkhardt relies not only on musical instruments but quotidian objects – a mixing bowl, a pair of shoes, a handcrank. Brendan Connelly, along with Brooke O’Harra, is a founder of Two Headed Calf and his composition is a hallmark of the company’s work. Over the years he has accessed a remarkable range of styles, instrumentation and ideas; each production has its own unique score that frequently reflects the subject matter, but maintains a certain voice that is distinctly his own. In this show, Connelly’s score seems a bit more overtly musical, somewhat less percussive and dissonant than in previous work. Once again, the music is deeply integrated with the words, they set them off and frame them, provide support and elucidation, drama and emotion. Syers’ divides the piece into five sequences, each named after an animal but for the final one, entitled “dawn”. Connelly and Syers strike a tone that is sometimes wistful and sometimes amused, even moving from playful to poignant within the same sequence. I don’t know the exact nature of Two Headed Calf’s collaborative process, but I am assuming that it was very close for both pairs of creators. Holding the whole thing together is O’Harra’s deft direction. She recently became a mother and I can only imagine that this influenced the process in some way. I’ve seen a number of Brooke’s shows over the years and they are often characterized by a certain frenzied energy and over-the-top theatricality. While You, My Mother is still very theatrical – there are animal masks and surreal costumes – the show comes across as a bit more measured and mature. The staging is simple and thoughtful, the actors move with energy and precision but never wander near the chaos and spectacle of earlier works. The performances are bigger than life but still nuanced and very controlled, there is a lot of room, not just space on the stage but within the work itself. Room for the actors to really inhabit the roles and room for the audience to both receive the staged work and project their personal experience into it. The ensemble – Beth Griffith, Laryssa Husiak, Mike Mikos and Kate Soper – give strong performances across the board. Even though not all of them are trained singers, the music seems to work to each of their strengths. They managed to balance the singing duties (with some pretty challenging music) with intricate choreography and solid acting. The same ensemble of actors and musicians performs both pieces and that continuity works in the favor of the project overall. It feels whole, a two-part reflection, a diptych if you will, on the universal mother and the mother in particular, singular and human. Simply put, I really enjoyed and appreciated the show. I found it very moving, insightful and emotionally rich while still being aesthetically and artistically adventurous and challenging. Kosmas and Syers are not darlings of the experimental literature set – I’m not sure who is – but they are doing important work that merits more visibility. So too with Connelly and Burkhardt. I know a lot less about the world of new music, but I know yarn|wire a bit, and know that they are well-regarded and work with really talented people. I’m not sure how Burkhardt and Connelly position themselves in relationship to the wider new music scene in New York, but I hope that this work is recognized by other artists and composers exploring the genre. You, My Mother continues at LaMama through February 20th – catch it while you can.